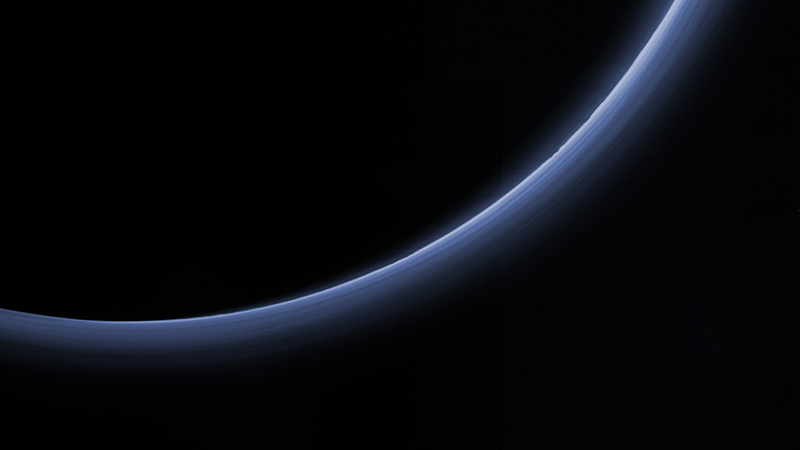 The most recent image from NASA’s New Horizons spacecraft, which sped by Pluto in July, 2015, reveal a wealth of new information about the dwarf planet’s atmosphere. The picture is of a blue haze—rendered in approximate true color—that presents a curious, layered texture, which scientists say is the result of haze particles in the atmosphere settling, and filtering down to the surface below. The haze itself is believed to be a “photochemical smog,” a hydrocarbon soup comprising an unsavory mixture of acetylene, ethylene and similar chemicals, which is generated from the action of the distant Sun’s light upon the methane in Pluto’s atmosphere. Among the many features to be seen within the eerily beautiful haze layers, which extend as high up as 200 kilometers (120 miles), are a number of jagged mountain peaks punctuating Pluto’s circular limb, and crepuscular rays, thin shadows cast by the planet’s surface features. The image was assembled from four panchromatic pictures snapped by the Long Range Reconnaissance Imager (LORRI), together with four-color filter data from the Ralph/Multispectral Visible Imaging Camera (MVIC). The New Horizons mission has shown Pluto to be a remarkably active little world, with an unusually young surface (at least as far as planets go), and a number of surface features attesting to internal activity and continuous cryovolcanism (ice volcanoes, where water does duty for terrestrial magma). Recently, images were released of Wright Mons, an immense Plutonian mountain suspected of being one of two giant ice volcanoes on the diminutive planet. At more than 150 kilometers (90 miles) across and 4 kilometers (2.5 miles) high, it is a kind of Olympus Mons of ice volcanoes—the largest of its kind in the solar system. “These are big mountains with a large hole in their summit, and on Earth that generally means one thing—a volcano,” Oliver Wright, a scientist with the New Horizons mission, said in a Daily Mail article. 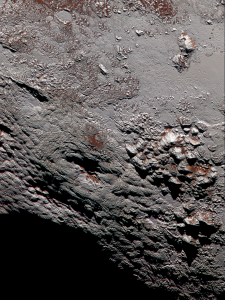 Future research is needed to determine if these huge mountains really are volcanic in origin; but if they are, as seems increasingly likely, they are probably implicated somehow in the formation of the vast, heart-shaped Tombaugh Regio, which was made famous last summer as Pluto’s most prominent feature in the first images returned from the New Horizons spacecraft.